After months of Dr. Meat's inane restaurant selections, I have inserted a bit of intellectual muscle over the restaurants we review. I have received several letters recognizing our new path and thanking me for usurping Meat's unbalanced influence. I must remind our readers, that it wasn't that long ago, that he was a befuddled, ignorant mouth with no understanding of this intricate and complicated business. Under my guidance, he is beginning to make simple observations and derive basic conclusions that separate him from most of the simpletons that read and write letters into our column. When I told Meat that we were reviewing Outback, he began a long diatribe concerning the time when he was a young boy in Wisconsin and dropped a headcheese sandwich into the "outhouse hole"
and had to jump in or he would go hungry. As he proceeded to discuss in great detail the energy needed to hunt wolverines in the winter with just a bowie knife, I had to slap him upside his dome to shut him up. After his eyes cleared and the drool dried from his chin, I explained the difference between an outhouse and Outback Steakhouse. I had him take a step forward, check his wallet for money, and we were off to eat. Meat was confused when we walked into the dark restaurant, but his mood improved dramatically when he heard "YMCA" playing on the in-house speakers. 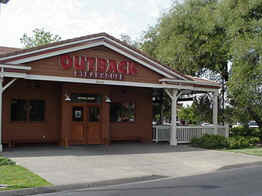 The decor of Outback is wood -- wood floors, wood tables, wood ceilings, wood bar, and wood walls. There are a lot of Australian pictures and artifacts tacked to the walls. The menu also reflects the strong Aussie theme. Their main selections include Jackeroo Chops, Brisbane Shrimp Sauté, and Ribs, Chicken and Steaks on the Barbie. Outback whose parent company also owns Carrabba's Italian Grill, is a very large international chain with restaurants in Hong Kong, Korea, Peru and Germany but interestingly, none in Australia. We both ordered the Outbacker Cheeseburger and Fries. At $6.99, it was cheaper than several of the burger only establishments. I had a Coke, and it was refilled several times by the wait staff before it ever reached bottom. I could not help grabbing for the fries before our waitress even set the plate down. They were perfect in everyway - fresh cut with skins, salted, not greasy and a very strong russet potato flavor. These could have been a meal by themselves and did not need catsup or season salt. The juicy patty was 1/2 to 1/3 pound of fresh, ground beef. It was fried and artistically seasoned with salt and several different peppers. The chefs in this kitchen understand that ground cow comes unseasoned and have combined an excellent combination of seasonings that causes the patty, when eaten separately, to exploded with flavor. The thin slice of American cheese was washed out under its meaty host. The only sauce used was a light coating of mustard, but that was all that was needed. The mustard enhanced the seasoned burger and did not need the standard bucket of mayo and catsup used at many burger restaurants. The rest of the condiments included a small slice of tomato, white onion pieces and a fist full of shredded iceberg lettuce. The bun, however, with the consistency of wet cotton candy was a major disappointment. It fell apart three bites into the meal. Dr. Meat, I am sure, did not discern this problem since he shoved the whole thing into his mouth. With an upgrade of the bun, this would have been close to the perfect burger we are searching for. Finding no similarities to his headcheese sandwich and Wisconsin frozen outhouse, Dr. Meat stayed a bit longer and had another round as I began writing up our review. We were both truly surprised to find such high quality at a large franchise and very disappointed when our meal was finished. My partner and I got a tip from a Cordova local, they said you need to go to the Outback for the "best burger" this side of Maui! I have been to the Outback numerous times for almost everything else on their menu and I have been pleasantly surprised at the consistent quality, portions, and the amazing flavors of all their meat focused dishes; so why not? We figured if we got there at the opening of the doors we would not have that horrendous wait this place is famous for, and if nothing else the comfortable atmosphere would be relaxing after a long day of educating tomorrow's leaders. An absolutely charming hostess sat us down in a very comfortable booth, it was at once rustic and plush. I smelled the soft seat and looked over the menu and ordered up one of their "Outbacker" burgers with fries and a fresh brewed Iced Tea. The tea was great and the refills were bottomless. A nice mix of Eighties hits were piped into the restaurant and the wait staff was friendly, sharp, attentive, and efficient. The burger arrived on a very hot platter, piled high with fresh French fries. These fries are what one expects when you order French fries. They were cooked in a peanut oil, they were not greasy in the least, the skins were on, and they were lightly salted. I am actually having a hard time writing this column because I can't stop salivating. It was obvious to me that my partner, the self esteemed Prof Burger, felt the same. He was jamming so many fries into his pie-hole that I thought the wonderful wait-staff might have to perform choke rescue. I thought I better slow him down a bit by taking his plate away but he attempted to jam a fork in my wrist, apparently he was unduly influenced by the whole violence theme at "Murder Burg". Just when I thought that the party in mouth cold not get any rowdier I tore off my perfunctory piece of the patty, placed it on my tongue, and the party turned into a full blown circus. I imagined the the old Budweiser commercials with taste buds all cheering for each and every morsel of the beef. It was cooked to perfection, hot, juicy, and the flavor of the meat, seasonings, and the expert preparation was so intense I thought I had a "mouthgasm". My partner on the other side of the table was growling and snapping like a wolf as he hovered over this masterpiece, he was speechless for once. In what can only be called an afterglow, I basked in the presence of a meal well done. My senses back to reality, it was time for serious analysis. My partner could not stop fawning all over the burger, but I did notice a couple of flaws. I hate nit pick, but as we have mentioned we are out to pursue perfection and we must remain objective even in the face of perfectly prepared beef. While Prof. Burger was weeping over his empty plate, looking like that old pollution commercial where the Native American sheds a tear at the polluted river, I got down to some serious scientific scrutiny. Although the patty was more than ample size, the cheese was a bit skimpy. I had a slice of Swiss and my not too cultured partner had a slice of American. I feel the patty was so well prepared that it did not even need cheese, but if they are going to put it on it better add to the burger rather than keep you guessing. The bun was a step above a "Wonder bun", but not much of a step. It was toasted, a rich cocoa brown, but it just did not have the stamina to hold well against the assault that patty brought to the dance. As the wait person brought our check I too was sad this experience was over. The delicious peppery sensation that was lingering on my taste buds was crying out for more, fortunately my stomach was the voice of reason as it was too full from the gigantic portions, for which the Outback is famous for, were true once again. One little tip to you dear readers, this is a bar and a restaurant. If you the reader have moral objections to those that imbibe the spirits, you should always go at the 4:00 o'clock hour. As we were leaving a member of the CHS class of '76 was doing her best to imitate the vomiting scene in "Stand by Me", one too many Lemon Drops is all the Bar Staff could offer. This burger, fries, and drink combo earned a respectable 85/100. I'll be back, my colleague will be back, we both will just avoid the bar, its not for those of us pure of heart and for those of you with children.